Standing Rock: Are pipeline protest camp days numbered? 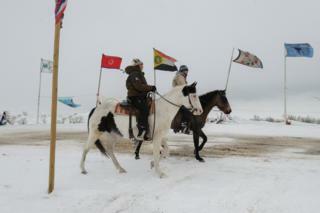 Image caption Horseback riders patrol the avenue of the flags in the Oceti Sakowin Camp. Winter is descending upon thousands of Native Americans camped out in North Dakota. For months, they have been protesting against the Dakota Access oil pipeline. The early snowstorms of the season are rolling across the prairie. Temperatures frequently drop below freezing at night. "We are prepared for the worst," says Noah Morris, an assistant medic based in the Oceti Sakowin Camp. "But the spirit of the people is good." Since April 2016, when the campaign to stop the pipeline began, the indigenous protest camps have transformed into an organised community. They lie spread across a valley near the Standing Rock Sioux Reservation, housing as many as 6,000 people in three distinct groups. The Sacred Stone Camp is dense, close to the Cannonball River, sheltered from the wind by a steep bank and clusters of trees. Oceti Sakowin Camp is sprawling, home to an estimated 4,000 people, huddled around sacred fires, chatting with friends, sheltering from the cold in trucks, tepees, tents and yurts. The Red Warrior Camp has become a command centre, a base from which disruptive "actions" are launched against the pipeline. Image caption The first winter storms blew into the Oceti Sakowin Camp over the Thanksgiving holiday. 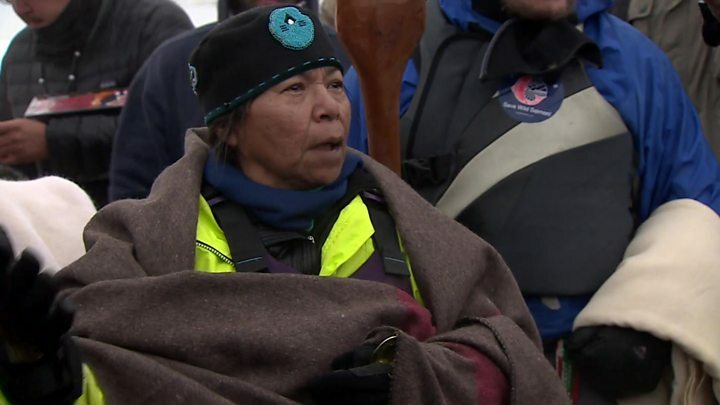 "Once this has all ended, we hope to establish something permanent here [near Standing Rock]," says Linda Black Elk, a resident of the camps and a member of the Catawba Native American nation. "The level of organisation we have is incredible," she added. "Some of the facilities are better than nearby towns. People are travelling here just to receive treatment in our medical clinics." Doctors, traditional healers and psychologists provide care free of charge in the Oceti Sakowin camp, out of a series of shelters close to the central fire pit. Storage tents, pinned down against the wind with tarpaulins, are piled high with donated gloves, hats and sleeping bags. "I talked to folks in the kitchens," said Dallas Goldtooth, a campaign organiser for the indigenous environment network, in a recent Facebook Live. "They could build structures for days with the amount of rice and beans they have." Many of these developments have been funded by social media campaigns. One GoFundMe page has generated over $140,000 (£112,485) in charitable donations for the camps. Although the vast majority of Dakota Access oil pipeline has been built, the section closest to the Standing Rock Sioux reservation - which will pass beneath the Missouri River - is still awaiting federal permits and approval. Image caption Firewood is the primary source of warmth in the camps, which lack electricity or running water. A permit was initially granted by the Army Corps of Engineers, but the Department of Justice and other agencies intervened to override the decision on 9 September. The government has been reassessing the situation ever since, including the possibility of a "reroute", according to US President Barack Obama. But the struggle between the coalition of over 200 indigenous tribes and the oil company Dakota Access LLC has intensified in recent weeks. On 25 November the US Army Corps of Engineers issued a letter calling for the Oceti Sakowin camp, which sits on federally owned land, be evacuated by 5 December. This was followed by a similar evacuation order from the governor of North Dakota. Those who leave will be permitted to continue their protest in a "free speech zone" south of camp's location, the letter states. Those who stay will be subject to fines as high as $1000 (£800). The Army Corps claims this removal will help "prevent death, illness, or serious injury… due to the harsh North Dakota winter conditions." Protesters, who prefer to be called "water protectors", disagree. "The most dangerous thing we can do is force well-situated campers from their shelters and into the cold," David Archambault II, the Chairman of the Standing Sioux Tribe, said in a statement on 28 November. "If the true concern is for public safety, then the governor should clear the blockade and the county law enforcement should cease all use of flash grenades, high-pressure water cannons in freezing temperatures, dog kennels for temporary human jails, and any harmful weaponry against human beings." "Marking people with numbers and detaining them in overcrowded cages, on the bare concrete floor, without being provided with medical care, amounts to inhuman and degrading treatment," the report stated. Image caption Traditional medicine is used in the camp, alongside conventional medicinal practices. The local Morten County police are being sued for excess force by a number of camp residents. They deny any violations, and have repeatedly accused the self proclaimed "water protectors" of acting illegally. "Protestors continue to violate federal regulations by using drones to harass and surveil law enforcement, endangering those below the device," stated a published report on 24 November. "Protesters also continue to target law enforcement aircraft with laser beams which is a Federal offense." Representatives of Dakota Access LLC have criticised the protest movement while stressing the company's cooperation with authorities. "We have been working diligently with local enforcement officials in North Dakota in their efforts to protect our construction workers and peacefully remove protestors who are trespassing on private land," stated a press release in early November. According to Kelcy Warren, the CEO of Energy Transfer Partners, delays in pipeline construction have cost the company over $450m ($362m) so far. Pipeline workers have also been adversely affected. "A lot of people have gone out there for a job, and found out they won't get paid because of a protest," says Kevin Pranis, a manager with the Labourers District Council, a union with 600 members working on the pipeline. "Construction workers are paid on an hourly basis. When things get held up, it has a direct impact on people's lives." Image caption An aerial view of the Oceti Sakowin camp before the snow, published by the Morton County police department. Ron Ness, the Chairman of North Dakota's Petroleum Council, believes the disruption will soon be over. "The project is almost complete," he said. "The indications are that Donald Trump will approve this pipeline on day one of his Presidency." President-elect Trump, who will take office in January 2017, is assumed to be friendly to energy concerns and has a personal connection with the pipeline. In May 2016, the Republican's financial disclosures revealed he had investments in companies affiliated with the pipeline, though the Dallas Business Journal interviewed a spokeswoman from Trump's transition office who claimed he sold all or most of these assets in July 2016. Campaign finance records show that Kelcy Warren, the CEO of Energy Transfer Partners, donated more than $100,000 (£80,437) to Donald Trump's presidential campaign. Still, the protesters don't plan to give up. "There are a lot of questions people have about what we are going to do," said Dallas Goldtooth, one of the leaders of the #NoDapl movement, via a Facebook Live on 27 November. "We refuse to give in to fear. The only statement we can make is if we move, it's on our terms."